Cebu Pacific Promo: JULYO Gonna Call? Gather everyJuan and book your tickets now! "Cebu Pacific offers Piso fare to Dumaguete and low low fares to other destinations"
Our latest ‪#‎CEBseatsale‬ is up. Grab this chance to go to Dumaguete for only P1 as base fare! For other domestic flights, P99 is the lowest base fare offered! Kindly refer to the photo above. 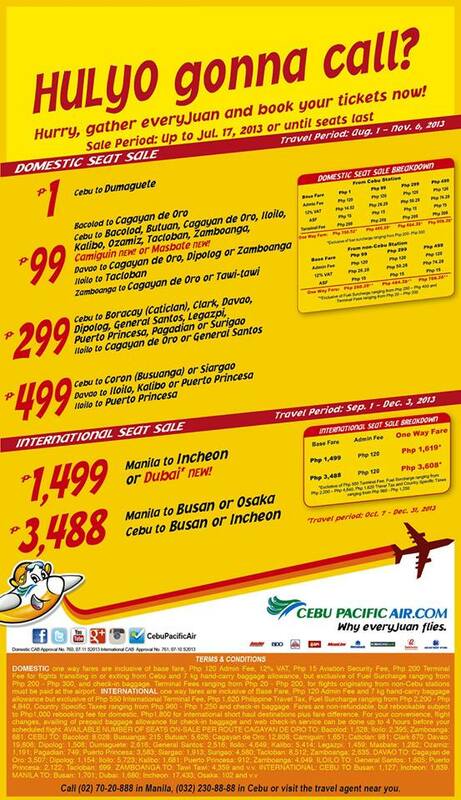 Cebu Pacific July 2013 Seat Sale!